Yan lives in North London with her wife, Marian, cat Kacey and her sourdough starter called ‘Muvver’. Yan was born in Hong Kong and moved to the UK when she was two, with her parents and brother Ken, she also has another brother Yee, and sister Ying. Yan eventually trained as a Biomedical Scientist and now works for The Francis Crick Institute as a Laboratory Research Scientist. Growing up in a Chinese household meant Yan’s family would steam rather than bake and used their oven as storage space. 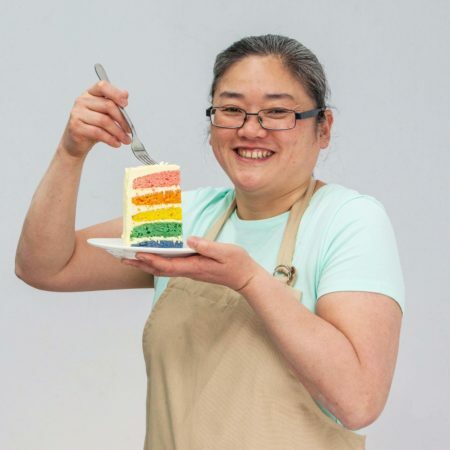 Yan began to take baking more seriously ten years ago when she found herself in between 24 hour shifts, working as a molecular biologist for the NHS. Raised by her very own hands. Yan’s chequerboard hand raised pie recipe is showstopping inside and out. Go wild with Yan’s tree-mendous jungle-themed bake, adorned with caramel decorations and hiding a secret design at its core. Sugar, spice and all things nice go into Yan’s Signature Teacakes (as well as flour, yeast, milk, butter and some other things).